The Green Microgym in Portland uses human-powered exercise machines to save power. A 30-minute workout creates about 50 watts, which is enough electricity to run a laptop for one hour or a phone charger for six full charges or one energy-efficient light bulb for 2.5 hours, according to ReRev, a company that retrofits gym equipment to capture human power. "It's not going to solve world's energy problems," said Hudson Harr, the company's president. "We're quick to dispel that it's a major utility contribution. It connects with people and it teaches people about energy." It's not likely to cut down the power bill for big sports complexes. Gyms have huge treadmills, flat screens, heating and air conditioning, and often require lots of energy. "The impact [of human powered exercise machines] is diluted by the massive consumption of the facilities themselves," Harr said. The modified exercise equipments take kinetic energy from a person's workout and converts it into a form of electricity. This gives people more motivation to work harder, Harr said. "The average user wants to up the resistance and test the limits and see how much they can send back," Harr said. But this concept of human-powered exercise equipment has not become mainstream. The idea is there, but implementation is going slowly, said Adam Boesel, the owner of a human-powered gym in Portland, Oregon. "Nobody is coming out with the Prius of exercise equipment," he said. "I think it's because big companies move slow. I liken it to the hybrid car. Five years ago, there were only a couple electric cars, now everyone wants to do it." 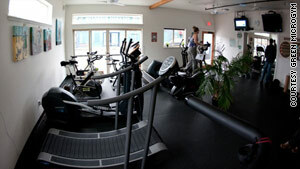 All the elliptical trainers and bicycles at his Green Microgym convert human energy. The human and solar power at the gym generated 36 percent of its electricity, saving about 37,000 kilowatt-hours in 2009, Boesel said. The average annual electricity consumption for a U.S. residential utility customer is about 11,000 kilowatt-hours. "The way we look at it, you can waste energy or not waste energy," Boesel said. "Anytime people exercise, that exercise is being wasted in terms of heat. We're trying to save a little bit of energy." The human-powered exercise equipments have not taken hold in the fitness market, but people are interested, said Bruce Bruckbee, a green consultant for hotels and sports recreation centers. "People feel as though they're doing something good. They're making good use of all the energy they're creating themselves and having a small impact on carbon footprint. What I think is most important is it creates a personal awareness," said Bruckbee, managing partner for Leisure Green. At the Cass Community Social Services in Detroit, the residents who are homeless, in transitional or temporary housing, never expressed any interest in environmental issues before. "Homeless people don't care about polar bears," said the Rev. Faith Fowler, the organization's executive director. "They care about jobs and health." But this year, the center introduced 10 stationary bikes (purchased through a donor) that send power back into the building. Residents became hooked. They started asking, "Can we start a garden and can we start composting?" Ninia Cobb, a 43-year-old resident, said the bikes give her two goals: to lose weight and to give back energy. "I'm not going to light up a whole building by myself," she said. "I feel like I'm helping the energy thing when you ride it. It feels good." The bikes attracted local cycling enthusiasts and youth groups into the center too. "They care about the planet, but they didn't care about the homeless," Fowler said. "They're sitting shoulder-to-shoulder to someone who has been homeless for two to three years, they sit and talk, and they're both acting as problem solvers." But not everyone implemented electricity-generating bicycles for environmental reasons. The Maricopa County Sheriff's Office in Arizona purchased a stationary bike that generates 12 volts of electricity to power a 19-inch television in the jail. Sheriff Joe Arpaio wanted the inmates to exercise. The bicycle will not save the county any money in terms of power bills, but it's making the inmates exercise every day. "It's caught on," Arpaio said. "The inmates seem to like it. The public, from what I got back, thinks it's a great idea. I don't know why no one's thought of it before."